One thing I am always asked is how to get started or what people can use to train their ratties without making or buying equipment to see if they and their rats will enjoy the sport. The very first thing you should do to train your rat, weather you are using $1,000 equipment trimmed in gold or empty cardboard boxes, is to have a bond with the rattie and teach the rat to come to it's name. It is also important that your rattie is healthy and rested and as I said bonded to the person that will be working with it. Please read our Training Your Rat(s) page at this site.....and yes, I know it needs work, lots of work. It may also help if you read our Rats Learning Tricks page. I have training tips on each that might help you teach your rats to learn. There are many things you can use that you have around the house to start or even just to have a little fun with your rats. Please make sure that what ever you ask your rat to get on or go through is safe and stable. You are only stopped by your own imagination. Once your rattie is trained you may want to make up or buy some actual Rat Agility Equipment. Either way, once your ratties have learned to run an Agility Course, grab your video camera and make your rattie a star. 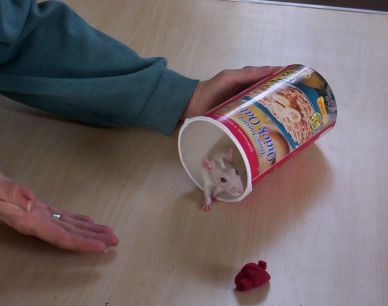 For instance...you can use an empty round oatmeal container with the bottom cut out for an "Open Tunnel", but you should hold the top of the container as the rattie comes through it or the container will roll. This may cause your rattie to feel unsafe. You can see my thumb in this photo lightly on the top of this empty instant oatmeal container. We cut a hole in the bottom for the rattie (Nineveh) to come through. Look at my left hand and you can see me holding this instant oatmeal container, with the bottom cut out, so that it does not move while Nineveh comes through it. This was her first time working with the "Open Tunnel" and she did well. Do everything you can to use equipment that is safe and stable for your ratties. Make sure that your animals have a good time as you work with them. The more you work with your animals the more you and the animal will want to do more together. The small red item on the table is a "ball" of knotted fleece I am using to teach Nineveh to play with. I am hoping to teach her to fetch. The fleece balls are easy for the ratties to pick up and light weight to carry. They are also easy to replace. I also have a crocheted pattern for making an "Open Tunnel" as well as a "Closed Tunnel" on our Rat Crafts To Make page at this site. I like using these because they are stable and can be washed in the washing machine. Ratties can and do use the agility pieces to potty in, so having a couple of these is a good idea. I also sell these items. This is LaRue coming out of the Tye Dye colored Closed Tunnel and going into the Red, White and Blue Open Tunnel. You can see his tail tells the story. There are many things you can use for an Open Tunnel. You could take an empty 2 liter soda bottle, clean of course, and cut both ends out. I would wrap it with something so that the rattie could see the sides, duct tape it nothing else, and not so that the whole thing is covered, it is fun to watch the ratties run through it. You could use a child's toy Slinky opened up a bit and curved. Just be sure what ever you use is not sharp on the ends and is clean and stable. 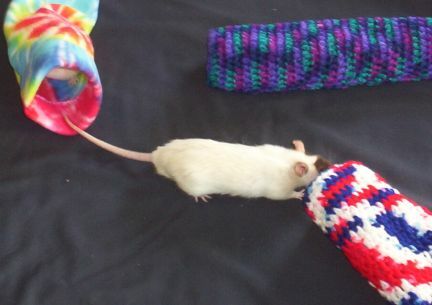 This is a photo of The Ballerina, a Hairless Dumbo Rattie, coming out of the hand crocheted Open Tunnel. For a "Balance Beam" you could tie a rope to the back of two chairs, pull the chairs away from one another to tighten the rope for the rattie to walk across. The size rope does matter. You will want a rope approx. 1" round and at least 12' long. To start you will just make a short tight rope, maybe 24". Keep your hands on either side of the rattie so that it does not turn around or loose balance (unlikely). You always want the rattie to come through an agility piece the same direction and not turn around and go the other way on the item. Otherwise this will be a hard bad habit to break later when you want the rattie to run a course. To make a Jump for your rattie to come over, use Locking Blocks, like Legos. Just make sure that the jump you build will hold the weight of the rattie and not tip over. Also make sure that the item is not too tall when first starting. You can add a bit of height later as the rattie learns to maneuver the item. I have a full jar of fruit in this photo of Nineveh. I have some empty jars, from the same, and a person could fill one or more of them with sand, gravel, or something to make the empty jars heavy enough for the ratties weight as the rattie comes over the jar. You could also stand a couple of these jars up, cut a small hole in two of them and put a wooden dowel into the holes (same height on each of two jars) and add weight to the jars so that they will hold the weight of the rattie coming over it. Also, make sure that the wooden dowel is in the holes so that it will not fall out when the rattie climbs over it. Another inexpensive idea for a jump could be to take two empty 2 Liter soda bottles, washed out of course, and drill holes in the sides of each at the same height. You could use a wooden dowel to put in the soda bottles to form your jump. Don't make it too high and be sure to add weight to the soda bottle bottoms so that the jump has enough stability to hold the rattie's weight. You could also use a short piece of wood 2" x 4" turned up on it's side....there are many ideas for jumps, just keep safety first. 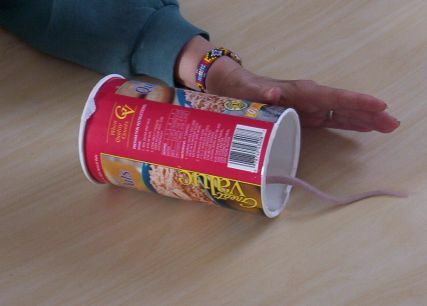 Use you hand first on the items you make up to determine if the item will hold the ratties weight. To teach the "Hoop Jump" Start training with a lid off an oatmeal container with the center cut out. You can wrap the outside of it so that they rattie can see it better if you like. To teach this, look at our Rats Leaning Tricks page for hints and helps. You could also buy a cheap round rubber dog toy and later mount it to a wooden frame for your "Hoop Jump". The rattie in this photo in Nineveh. She is just learning to come through the Hoop and doing well. She is approx. 18 weeks old. This item you need to be very careful with...the "Teeter Totter". The Teeter Totter is not as tall as the See Saw and for starting you need to use something short. Make sure, make absolutely sure, that what ever you use is safe and will not fall off whatever it is teetering on. You could use a hard bound book on a wooden dowel. Or even a pencil or marker for the book to pivot on. 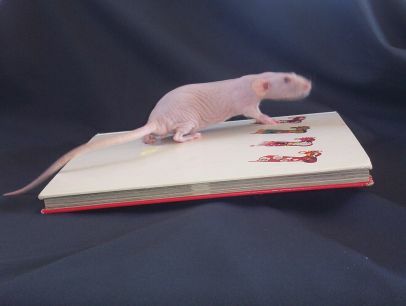 In the photo I am using a larger flatter book (one I do not care if the rattie pee on) with a permanent marker under it for the pivot. Make sure that your "pivot" stays in the center of the book and does not slide around. When teaching this piece make sure you have taught other pieces first so that the rattie will have some confidence. The Hairless Dumbo Rattie in this photo is approx 20 weeks old and we call her The Ballerina. 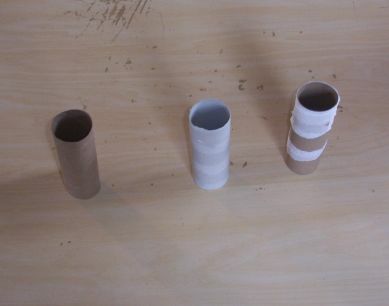 You can use three or more toilet paper rolls standing on end to make Weave Polls. It would be a good idea to tape these down to a piece of cardboard or to the table so that they do not move them if they are "hit" by a rat running through them. For a "Pause Table" one could use a cardboard box, remembering that it may get peed on and need to be replaced often. The one I am using in this photo has the ends retaped shut to give it some strength. I wanted it to hold the weight of the rattie without sagging or falling over when the rattie dismounts. The rattie you see on this box is Nineveh at about 4 months old. When you first start training the Open "S" Tunnel it is a good idea to only teach 1/2 of the tunnel at first. When the rat is coming through the piece reliably you can add the other half and continue training. 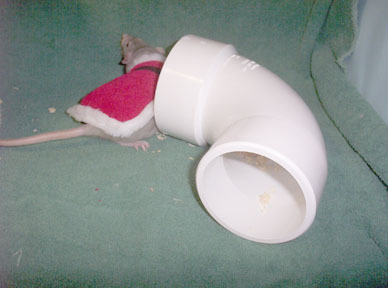 As you can see, Annabella, a blue dumbo rattie, dressed in a Santa Suit, has decided not to go through the tunnel, just as we go to take the photo....figures, ey? 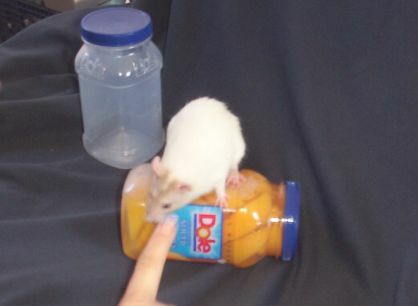 These are just ideas we have used to start ratties and introduce them to items. The more different items your rattie sees and uses the more of an edge you will have in competition. Your rats confidence will be built by using many different safe types of items as Agility Equipment. We are not there to check how you are making these items or training on them....we will not be held responsible for your equipment or your training of your rat. As we have said over and over on this site.....Keep safety first. Train your rat with caution. Make it fun for both yourself and your rats...believe me, you will both have a good time. The contents of this page for Getting Started is still under construction. Please check back later! HOW HARD IS IT TO TRAIN RATS TO RUN AN AGILITY COURSE? Well? LOL That depends largely on the animal and the trainer. If you have trained dogs or cats or any type of animal you are "one up" on someone that has never trained before. If the rat is healthy and is bonded to the owner that will also make a huge difference when training Agility. Does your rattie love treats, that also may help in your training. All in all, it is not too hard to teach a rat to run an Agility course. If you are consistent and fair with the animal, it will come relitivily easy. Think of it like this.....if someone came to you and spoke a foreign tongue and was trying to teach you something what would it take for you to understand? Work your rat with that same perspective. I have honestly seen humans talk louder to a rat thinking, I guess, that the rat would understand better if it were just a bit louder. LOL Now you understand what I am saying, ey? Rats can and do learn words we teach them. Words, not paragraphs. Keep commands in words and use the same word consistently. Something I have noticed with the average person when they train a dog....when they tell the dog "down" it might mean, "get off me" and another time it might mean to "lay down" and another time it might mean to "get off the couch". Now, most dogs can understand, but it takes longer. For instance, if you use the same word "down' for all three commands heres what might happen....you come in and the dog is sitting on the couch. You say "down" and the dog lays down on the couch and you get mad at the dog......who is in the wrong here? LOL Keep the same word for the same action you want and use it each and every time. HOW DO I GET STARTED WITH MY RAT AND RAT AGILITY? First and foremost, start with a healthy rattie that is bonded to you. One that comes when it is called or at least follows your finger on a table. Please see our Getting Started Page here at this site for more information. I HAVE MORE THEN ONE RAT, CAN I START BOTH OF THEM TOGETHER? Yes, but let's clarify "together". Train each rat one at a time with the other in a holding cage set up where it can see the other rat being trained. You may actually have more success training like thios then someone training only one rat off and by itself. HOW OLD DOES A RAT HAVE TO BE TO PARTICIPATE IN RAT AGILITY? Most people make their own Rat Agility Equipment. You can see some of the measurements on our The Equipment page here at this site. You can also use "make shift" equipment with items around your home. See our Getting Started page for ideas. Just make sure what ever equiptpment you chose it is safe and stable for your rattie. We are working here at The Agile Rat to offer (in the future) some Rat Agility Equipment Packages. Please check back. I recommend you spend time with your rattie a few, at least twice, every day. You do not have to be training each time, just spending time with your rattie. I highly recommend that if you have an event coming that you spend at least 10 per day training or readying your rattie for the event. An event can be competition, an organized training section with friends, a demonstration you are putting on for a local school, church or other organization.....or, even if you are just going to show off for your family and or friends. The more time you spend with your rat, the more time you and your rat will want to spend together. WHAT PIECE OF EQUIPMENT SHOULD I START MY RAT ON? Keep working with the same piece until your rattie "gets it" and manipulates it correctly, getting on and getting off in the right manner at the same end of the piece each time. After the rat has learned the first piece well add another piece behind this first one. Work the rattie in a continuous matter. In other words have the rattie do the first piece then do not reward until it does both pieces....piece one then piece two, then reward. After the rat has learned to run two pieces well and correct add a third piece and so on until you have your full course set up. It depends on what you are doing at the time. Is this a training event? Has the rattie learned to use each piece of the course? Is this a Competitive Event? It also depends on how many pieces of equipment are available for use. Do you own one piece of 20? Rats are smart and with good training and for a good treat many will run the course no matter how large it is. MY RAT HAS LOST INTEREST IN TRAINING, WHAT DO I DO? Change your training technics. If you train on the same table the same course the same direction each time your train (and I recommend this to start) change the side of the table you stand on, change the course, mix up the pieces of equipment so that it is a new course for the rattie to run. Bring new and tasty treats. Make a bigger fuss over your rattie as it preforms. Just make it fun for the rattie. Many times if you start a new rat, while the rat you were formally working daily watches, it will refresh the oldsert to want to "play" again. Many times too, it will help both ratties, watching one another to do better when running the course. (This is true with all animals including human children). Maybe not, but I bet if there are other rat owners they would be interested in learning more about Rat Agility. You might want to start a group. I did this in WI by just setting a date at a park and inviting friends that had rabbits and ratties to join me there for the fun. I took the equipment I had and we had a ball. We met twice a month and ate out, dutch treat, after the event. Some evenings we had as many as 14 people that participated. Some people, mostly in the UK and Sweden call the equipment pieces fences because all small animal (including dog and cat) agility ideas came from horses in Steeplechase. Steeplechase is an obstical course with many types of fences for the horse to jump. Dog Agility came next and so people called the jumps fences for quite sometime. When it came to rat agility many people continued calling the equipment fences, even the tunnels may be called fences. WHAT IS THE DIFFERENCE BETWEEN AN AGILITY COURSE AND A MAZE? An Agility Course has equipment on it that the rat will menouver over, under around and trough. A Maze is usually a "puzzle" set up out of cardboard or wood with high walls and dead end halls that the rat must get through for a treat at the end. PLEASE JOIN US ON A YAHOO GROUPS ELIST CALLED THE AGILE RAT. WE ARE A FRIENDLY GROUP AND WE LOVE TO HEAR ALL ABOUT RAT TRAINING AND GENERAL RAT STORIES. YOU CAN LEARN MORE ABOUT RAT AGILITY TRAINING AND EVENTS, MEET OTHERS THAT ARE TRAINING AND ASK ANY RAT QUESTION ABOUT CARE AND OR TRAINING OR ANY THING ELSE YOU MIGHT WANT TO KNOW. I was once again Interviewed, this time for a Polish Blog. I thought I would post my answers here. 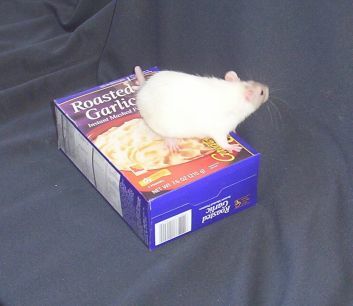 > How did you start training your rats? Even as a child I owned and trained many animals. 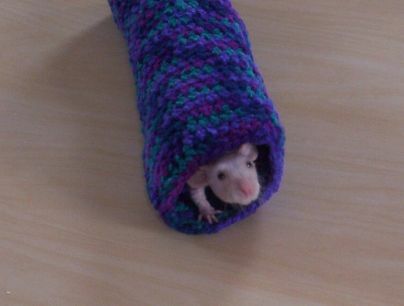 So when I got my first Pet Fancy Rat it was not long before I was making items like toys and clothing and outfits for them and dressing and training them. I first taught them to come when called. I did this by calling their names when feeding them and when I reached into their cages to pick them up to hold them. From there I taught them "shoulder", meaning to the rat that when I put my hand in their cage and say "shoulder" they can/should run up my arm to my shoulder. I also teach my ratties to "go home", same in reverse. Soon after getting the ratties I taught one to ring a bell I hung in it's cage. I made/hung the bell on wire and added wooden beads on it to interest the rat. When the rat played with the beads the bell rang. Well, like Pavlov's Dogs, this trick was easy to teach. Teaching a rattie to play a little toy piano is a bit harder, the behavior is easy to teach, I only say hard because you have to teach them to really hit the keys with their little feet. Unlike a dog, rat's paws/legs are very light, so making the keyboard product the sound is the trick. > Have you already had any experience with training Agility? Before I started training the ratties, just a bit of Dog Agility on our own property with a few pieces of agility equipment for fun. Now we, my husband Deron and I, have trained ratties, guinea pigs, mice, gerbils, hamsters, dogs, goats and I am sure I am forgetting someone on agility equipment. I am VERY Blessed, my husband, Deron, builds all of my equipment (agility and other) and will come out and play/train with the animals and I. > How many rats have you trained? I have trained six ratties to do a large course very well so far. Others too, just playing around on shorter courses. Nineveh was a thrill, she learned easily. I have a YouTube video of her on a course that she had only experienced two of the many pieces before the video, she is going slow on the video, but right along. She learned that course very well, very quickly. I did not own a video camera at that time....sure wish I would have memorialized her later as she was breezing along that course on film too. <sigh> Nineveh learned a 12 piece course and did it well and quick. I could change the pieces around and it would not faze her a bit. Then I had Regina, a Dumbo Eared rattie, who did well, but was not as fast. She however would go 6 - 8 pieces of agility equipment quite well. I had a few other rattiess in between, but quite honestly, after loosing Nineveh, well, I then focused on training my donkey to pull a cart and goats to run an agility course. Then came Little Mac. What a boy he is. However, bucks are bucks. In the wild male rats, known as bucks are quite lazy. The females, known as does, do all the work including bringing meals back to the liar for the bucks. Little Mac is also a Dumbo Eared. My experiences has been that Dumbo Eared ratties are more laid back. Little Mac is so funny. If he wants to do tricks and tasks and agility, boy he will, and he does it all very well. If he does not want to, oh well, nothing will change his mind. I do however have a few of his good runs, agility, and him playing piano wearing a tux, on video at YouTube. He is now working on some other tricks and most days does them well. We have a few more videos with themes planned in the near future. We, Deron and I, each training one, have just started two new baby rattie does too. (as well as a couple of hamsters) I should also tell you that many times I start rat pups (baby ratties) out on my Hamster Agility Equipment. It is easier for them to manipulate and not as intimating for them. > Which of your rats was most successful, and which was most challenging? I had a couple of really easy to train, fast learning doe ratties. Sugar and Nineveh. Of course I did not have them at the same time. Sugar was my first Agility Rattie. When Deron and I put a pencil to how we wanted to build our rat agility equipment and finished building it, I could hardly wait for the paint to dry before adding rat. <grin> And because I had handled her a lot, she came to her name, and would follow my finger, she was a breeze to train. Nineveh was also quite easy, quite fun and easy to train. Little Mac, as I have said above, is the most challenging. Bucks are indeed harder to train then does. When bucks are young, they will learn and do the most, as they mature, they get lazy. And as I have said before, my experience has been that Dumbo Eared ratties are more laid back then the Straight or Standard Eared ratties. > How long does it take to train a rat in Agility? That is like asking how long it takes to potty train a human toddler. It depends on the mother/trainer more then the child/animal. If a person has a rat that they spend time with, one they carry around on their shoulders, one that trust them and they have a bond with, it does not take too long to train that rattie to an Agility Course. Maybe even a couple of days for a three to six piece course. Now what I am saying is that in a couple of days, a fair and consistent trainer, could teach a rat that when the rattie was sat down in front of the agility pieces of equipment that are lined up and ready to go, the rat will know where to go and how to manipulate each piece of equipment. But for the average person with a full time job that only trains the rattie once a day in the evenings, it is going to take longer for the rattie to understand how to run the course/manipulate the pieces of agility equipment. > Is it possible to determine which rat will enjoy training, and which will not? Yes and no. You can tell once you have begun training, after you have spent some time with the ratties, but for the most part you can not tell if the rat is really not interested or just does not understand. I always tell people that are training animals to think of themselves being taught something by someone of another language. You do not know what the words mean and saying them louder is just stupid......but we all do it. <grin> You must use one word for each task. You need to name your agility pieces, such as "Window" for the Window Jump, "Beam" for the Balance Beam and so on. You also have to have one word that you use for a task. You use that word and only that word over and over and over. When you teach the word, "over", your rattie will then know that it is to go over whatever you put in front of it. When you teach "under" it will learn no matter what you put in front of it, it should go under it, and so on. This makes the training easier for animals. So, when training animals, it is a matter of training/disciplining yourself also. You need to be be very patient, you must be consistent and train a few minutes two or three times throughout the day, chose and use one word for tasks and items, and be fair and just to your animals. My husband and I get so frustrated with people with unruly dogs that will tell the dog one day to "off" when they mean not to jump on them. Then they will say "down" to not jump on them. They go on to tell the dog to lay down using the work "down" but then when the dog is on the couch and they are shouting at it "down!". The dog is not stupid or deaf, it just does not know what you are talking about.....very bad training. The same thing with ratties. If you want your rattie to climb your pants leg to come up to you, use one word. Always the same word. 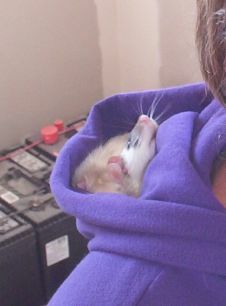 Not "climb" one time, that did not work so you used "up", then the rattie did not come up so you shout "SHOULDER!". Again. Teach what each word means to the rattie, then always, always, use that same word. > Do you train any other animals? I have trained everything from a mice to horses. Chickens, gerbils, a donkey, llamas, goats, cats but I guess mostly dogs. I have worked with dogs all my life. We broke out our own horses and a pony, trained a donkey to cart, our goats and llamas to wagons and cart, and ...... Yes. Deron and I met when we were both racing sled dogs that we had trained ourselves (each our own teams of course). The first animal I remember training was a pet Bantum Chicken to do tricks. I was about 6 years old at the time. > Do you use clicker training? No. I don't care for the clicker. I use the word "good". My voice is familiar to my animals. I can change my voice to fit the situation. I can make it happy, louder, softer, encouraging as in dragging out the word "gooooood" for them to know "almost there, little more" and more. My voice is unique as opposed to every clicker (most anyway) sound the same. Have you ever been to a dog training class where almost every person their is clicking away with their hand held clicker? Very annoying. Many times if you talk softer to an animal you are training, you will gain their attention if they are distracted. The contents of this page for FAQ is still under construction. Please check back later!